Could 12 inches be the sweet spot for Apple's larger iPad? More manageable than 13 inches? While rumors of space gray iPad 5s and iPad mini 2s swirl, another bit of tablet-related twitter has Apple working with a familiar face on an over-sized slate. According to Chinese site United Daily News (by way of MacRumors), Apple has teamed up with Quanta Computer to develop its larger iPad, what the publication refers to as a 12-inch device. Quanta is a current supplier for Macs and iPods, so it's no stranger to collaborating with Cupertino. It doesn't make tablets however; that's territory marked by Foxconn and Pegatron. Still, Quanta is said to be looking to diversify, so perhaps a larger iPad is the perfect product for it to broaden its portfolio? Is 12 the magic number? Of course, take all this with plenty of salt grains as we can't confirm without Apple's official word. Still evidence is mounting that Apple is at least kicking around the idea of a super-sized iPad. In July, the Wall Street Journal reported Apple was testing prototypes of a tablet with a display "slightly less than 13-inches." The same report said Apple was also looking into smartphone screens bigger than the iPhone 5, too. Thirteen inches is good chunk of real estate, and 12 isn't that much smaller. Weight would certainly be an issue as would thickness, two things Apple is known for keeping at a minimum with its tablets. 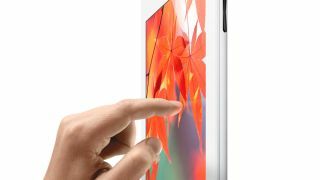 The rumors may not pan out into the real thing, and we're unlikely to learn more at Apple's rumored Oct. 15 iPad event. However, with an ever-growing number of competitors chomping at its market share, Apple could be eying some diversifying of its own as well. Looks like that "larger iPad" is known as "iPad Pro"